The World Community Development Conference 2018 at Maynooth University provided renewed motivation for a community development approach for the work of Rohingya Action Ireland and the resettled Rohingya community living in Carlow. The community, a total of 78 Rohingya refugees have resettled in Carlow town. They arrived in April 2009 from two refugee camps in Bangladesh – the world’s largest Kutupalong refugee camp and Nayapara camp. The process of resettling and re-integration to a new life and culture was managed by St Catherine’s Family Resource Centre and assisted County Carlow Development Partnership, volunteers, churches, schools, colleges and civil society organisations. Almost 10 years on, the Rohingya community have witnessed many different approaches in the resettling process. After members of the Rohingya community attended the World Community Development Conference in Maynooth in June it was clear that a grass roots approach would continue to ensure that the Rohingya community in Carlow continue their new lives with choice and opportunity. This approach stipulates that members of the Rohingya community work together to meet their own changing social, economic and cultural needs. This is already happening in Carlow where the needs of the community are identified by the community who work closely with local partnerships and support organisations. The workshops and discussions at WCDC 2018 provided ample food for thought on best practice in activating a community and reinvigorated what community development means in practice. Discussions were held on representative and meaningful participation, engagement of all community members and moving from dependence to independent living. Many of us involved in community development have witnessed ‘the refugee’ being defined by a charity model view as impoverished and disenfranchised compared to the social model approach as being defined as a valued member of the community, with the capacity to lead, to educate, to participate with their own expertise in what they need. Written into the terms of reference of Rohingya Action Ireland are community development principles, practices and values, which explore cultural, social and political opportunities to advance the human rights of the Rohingya. RAI aims to ensure that the Rohingya voice and experience of all genders stays prominent and remains at the forefront of any campaigning. Moving from an approach of ‘doing for’ to now ‘doing with’ has established stronger links with civil society organisations working together in solidarity, adhering to the principles of community development of collaboration, empowerment, social justice, gender equality, community self-determination, participation and inclusiveness. The WCDC 2018 inspired the founding members of Rohingya Action Ireland, Mohammed Rafique, Haikal Mansor, staff from Carlow College St Patrick’s, Carlow County Development Partnership, TUI and Burma Action Ireland that a community development approach has worked and will continue to work as the Rohingya build new lives in Carlow. The conference also provided an opportunity to present the Rohingya Photo Exhibition to communities and activists from around the world. The exhibition was opened by conference chairperson Anastasia Crickley and was displayed in the library of Maynooth University. It provided participants at the conference with an opportunity to reflect on visual images of the level of human rights abuses directed at the Rohingya in Myanmar. 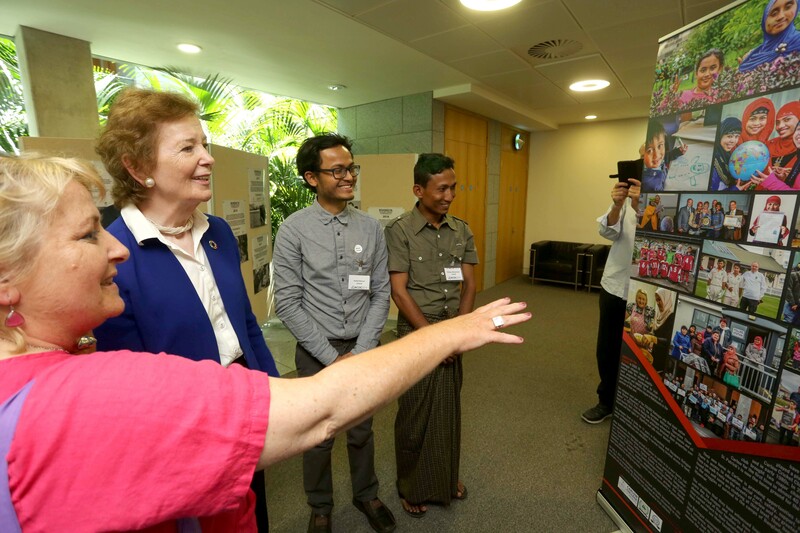 Mary Robinson attended the exhibition and spoke with members of the Rohingya Community offering encouragement and solidarity to the community. The Minister of State for National Resources, Community Affairs and Digital Development, Seán Kyne, also visited the exhibition along with keynote speakers and prominent activists at the conference.